And The NextGen Digital Challenge 2017 Winners Are . . . Announcing the results of the UK’s 7th annual NextGen Digital Challenge Awards, Iain Stewart MP (Chair of the All Party Parliamentary Group on Smart Cities) congratulated the finalists for this 7th year of the NextGen Digital Challenge. In his address at the Awards dinner in Westminster, Ian Stewart summarised the progress being made in Parliament on the policy framework for a range of ‘smart’ initiatives including the advent of driverless vehicles. Following Iain Stewart’s address, Richard Hooper (Chair, Broadband Stakeholders Group) and Derek Wyatt (Chair, Foundation for Information Society Policy) presented trophies to the winners across seven categories of digital endeavour. The NextGen Digital Challenge Awards programme celebrates great projects. Every year the awards are adapted to reflect current trends and priorities in digital application. Whether in Public Service Transformation, development of Digital Skills or new initiatives in Place-Making, these projects illustrate the wealth of creativity and innovation evident throughout the UK economy. More than a focus on individual leaders, most inspiring developments are the work of collaborative teams who strive to ‘do things differently and do different things’ — innovating to overcome the inertia of established custom and practice. The Awards Dinner in Westminster also heard former MP Derek Wyatt describe the plans for the 2018 ICF Global Summit in London next June. This 3-day event will bring civic and industry leaders from around the world to celebrate the development of Intelligent Communities. Digital Challenge Awards Co-Founder, David Brunnen, also thanked the 2017 Judging Panel for their great work in assessing more than 30 shortlisted finalists each with their diverse Challenges, Solutions and Achievements. The London-based Centre for Cities does exactly what it says on the tin. They advocate for better recognition of the economic and societal strengths of the UK’s major conurbations. ‘Cities’ according the Centre for Cities, ‘do not follow the national economy – they ARE the national economy’ – and their diversity demands that each of them have different priorities to meet the needs of their citizen and business communities. This diversity of needs and priorities stands in sharp contrast to Whitehall’s grasp of the economy. The UK is, measurably, the most centralised of all developed nations. Even with limited sub-national devolutions beyond England and the cautious local empowerment of Metro Mayors and City Deals within, it is clear that in so many spheres of our regulated regime, we have a complex challenge – an inability to align centrally planned resources with local needs. None of that is news. The debate, like some slow-brewing tropical storm, has been building over the last three decades – centrally evidenced by the RSA’s City Growth Commission and today (rather more locally) illustrated by the energy around Bristol’s brilliant ‘Festival of Ideas’. And this locally-driven rebalancing energy is also evident across many UK cities – at a pace, intensity, creativity and engagement that leaves Whitehall Departments in the shade. This renaissance – the emergence of inspired local leadership and willing communities – is also a cultural expression that positions exponents at some distance from the tired dogmas of national political parties across the spectrum. Critical impatience is, for example, articulated by Metro Mayors, regardless of Party affiliations. The Centre for Cities noted the marginalisation of these local champions at recent Party conferences and, this week, the C4C lead story is a repeat of a powerful post-election view of paralysis in parliament with a call for MP’s to support local initiatives. I’m not a disinterested observer. I’ve written previously about Municipal Enterprise and the need to translate and apply the work of fresh economic thinkers like Kate Raworth and Mariana Mazzucato from national to more local perspectives. I’ve watched the brilliantly creative work of Knowle West Media Centre building community cohesion in part of Bristol and for several years I’ve contributed to the work of the US-based Intelligent Community Forum with its global network of around 160 cities. Whilst our national politicians are looking elsewhere, the new localism is an unstoppable force. This is an energy that is likely be further bolstered by the Intelligent Community Forum’s 2018 Global Summit when civic leaders, CIOs and community developers from many of the world’s leading cities come to London next June to share their experiences. The current holder of the title ‘Intelligent Community of 2017’ is Melbourne, Australia. In recent years UK cities have rarely featured in the rankings but this year Knowle West was assessed as being amongst the Global Top 21 – a huge accolade for their imaginative creativity. Let’s be clear (as politicians are fond of saying) communities are both economic and societal constructs – they embrace both the places where we work and where we live – and those of us who commute may belong to two or more. In the gradual evolution of local empowerment, the creation of Local Enterprise Partnerships was supposed to have been a step along the way. No doubt they can claim some economic impact but for their wider communities these efforts pass largely unnoticed and, as noted in this week’s Economist, the divergences of well-being means that many feel they are being left behind. Rather than celebrate diversities the good citizens of less-prosperous places are more likely to fret about ‘post-code lotteries’ when austerity drives down public service standards. Fortunate indeed are those places that rise above party politics to embrace inspired local leadership. But this is a balancing act – local threads woven into wider regional fabrics. What marks out the new New Localism are signs of vastly greater local engagement – and with that higher-octane fuel the drivers of the UK economic performance and our social and cultural developments are very firmly in the hands of local communities and their place-makers. Seven years ago the NextGen Digital Challenge Awards programme was designed to highlight the need for much stronger investment in digital access infrastructures. The awards were very different from the usual run of industry accolades for people and products. It took a while but eventually contenders understood that the winners produced brilliant and succinct project case-studies explaining their challenges, solutions and achievements. Seven years on the rules remain but the field has evolved. Every year the awards categories have changed to include new frontiers. From the early, narrow, focus on Urban and Rural broadband deployments, the glittering trophies now also recognise innovative endeavours in the use of these utiities. 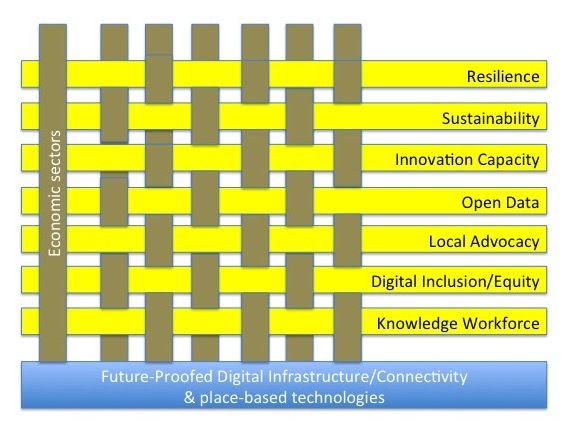 That doesn’t mean any let-up in the push for better digital infrastructures but it does provide great inspiration for project teams grappling with the challenges of making all this connectivity stuff really useful. We started again this year with the Open Call – to see what sorts of projects would be nominated. Only then were the contenders sorted, shortlisted and invited to submit their project stories for the 2017 selection of awards. This process keeps the programme relevant – and, whilst some themes continue, others come into focus. Projects that might once have fitted a general ‘Digital Inclusion’ category may now find they are contenders for the Digital Skills Award. Right now the Finalists for each of seven trophies are just one week away from hearing if their projects have convinced our independent judging panel. The 2017 awards will be presented at a dinner in Westminster on October 23rd. Why, you may ask, is the Driver & Vehicle Licence Authority (DVLA) competing against an NHS contender for the Digital Health Award? What sort of project, nominated by the Yorkshire Dales National Park, is competing against a Liverpool local currency for (new this year) the Place-Making honours? How come a small village not far from Leeds is battling with the big beasts of broadband for the Connected Britain Award? What is certain is the Digital Challenge Awards programme has once again served up a rich selection of project examples that will inspire and inform – not least because many of these stories will be used in schools, colleges and universities to stretch young imaginations. The presentation dinner will not only bring these UK project champions together but will also raise the curtain on an even bigger gathering next year when mayors, CIOs and community leaders from around the world assemble in London for a three-day focus on the making (and sustaining) of Intelligent Communities – the purposeful outcomes enabled by ‘smart’ technologies. Judging by this year’s crop of project endeavours, we will have many great examples to share with high-powered visiting delegations to the Intelligent Community Forum’s 18th Global Summit. And it’ll be the Finalists in the 2017 NextGen Digital Challenge Awards who will be able to say ‘We heard it here, first, on this channel’! The 2017 NextGen Digital Challenge Awards dinner will be held at 1 Great George Street, Westminster, starting at 19:00. Former MP Derek Wyatt will introduce plans for the June 2018 events. The after-dinner speaker is Iain Stewart MP – Chair of the All Party Parliamentary Group on Smart Cities. The seven 2017 Awards Categories are for exemplars in: Public Service Transformation, Digital Health, Digital Skills, Place-Making, Innovative Projects, Connected Britain and Networking Innovations. 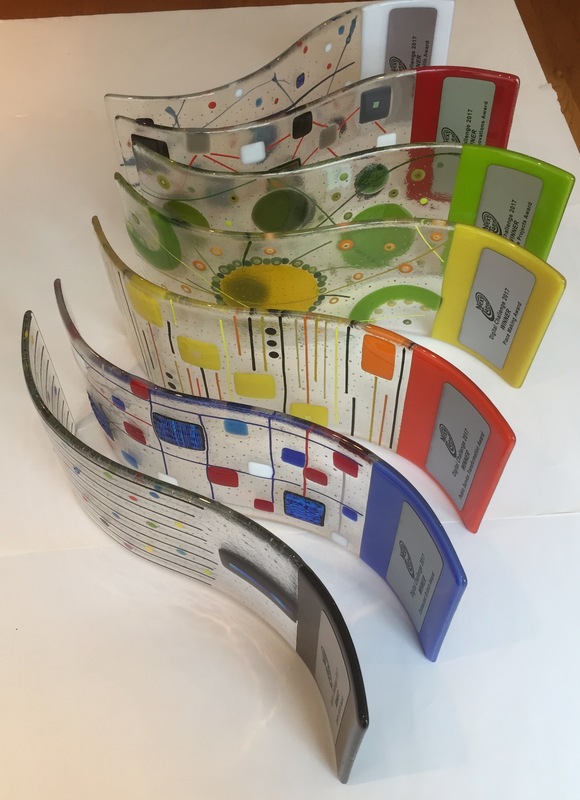 The brilliant hand-crafted glass trophies are the work of artist Helen Thomson (Fantasia Glass). Dinner capacity is limited but requests for any late availability places should be routed to mailto:awards@nextgenevents.co.uk before 20th October.